In this article we’ll take a look at the exciting world of diamond alternatives for your engagmeent ring! They’re becoming more and more popular as engagement ring options, as brides realize that there are a whole range of non-diamond alternatives to the traditional clear diamond we are all familiar with seeing. The white dress, the first dance to slow music, the beach honeymoon … it seems like the wedding is already mapped out for you by tradition. And then there’s the ring. Ah, the diamond ring. The diamond engagement ring wasn’t traditionally a diamond; it was just a ring. Who knew? Why Buy a Diamond Alternative? Applying the belief from ancient Egyptians that circles were a symbol of eternity, the ancient Romans began giving betrothal rings instead of a dowry. Each bride would have something of significant value to represent the commitment of her betrothed. Taking things to a new level, the tradition of a diamond engagement ring can be successfully traced back to 1477. An Austrian royal commissioned the creation of a diamond engagement ring for his betrothed and a trend was born. Every European aristocrat had to have one! This tradition has captured the hearts, fingers, and wallets of nearly 80% of engaged Americans. Don’t get us wrong; we think diamonds are a great choice! Diamonds are the hardest mineral on the planet and a great choice for a ring to wear everyday. Yet, this great option might become just a good option when compared to these 23 diamond alternatives. Get ready to have some fun, because we’re sure that one of these diamond alternatives will peak your interest. IMPORTANT: We are including a quick note on the Moh’s scale and why it’s important when considering a gemstone for your diamond alternative engagement ring. We’ve organized the gemstone types below from hardest to softest usuing the Moh’s Scale. Because let’s face it, you probably won’t want to buy a pearl engagement ring that she can’t wear everyday — it is just not suitable! What is the Moh’s Scale? Basically it is a measurement of relative hardness of a mineral by its resistance to scratching. The scale runs from softest (1) to hardest (10). Check out Wikipedia for further reading. We looked everywhere to bring you this roundup of outstanding examples of each gemstone type. The rings below really showcase a particular cut, sparkle, or stone. Click each image to find out more information, including purchasing details from trusted online sellers such as Etsy, Amazon, and Bluenile. Founded in the late 1800’s Moissanite created valid excitement in the diamond industry, finally a stone that looked just like a diamond! Although Moissanite is a naturally occurring mineral, it is not found in abundance, so the majority of what’s available on the market is synthetic. With hardness on the Moh’s scale of 9.25 – 9.5, this stone is almost as hard as a diamond and a terrific alternative for an engagement ring. For the bride that is looking for the diamond look with a slightly lower price, this could be the winner. Sapphires may be the most celebrated of all colored gemstones. The most recognizable color is blue, which I almost received as my engagement ring because my husband loves the deap blue color so much! Yet this precious gemstone comes in every color except red — the red sister of Sapphire is a Ruby. With a hardness only one point below a diamond on the Moh’s scale gives this stone a nearly perfect hardness for everyday wear. We love this stone for an engagement ring. We recommend that you consider yellow or pink sapphires. They will leave your eyes in awe! 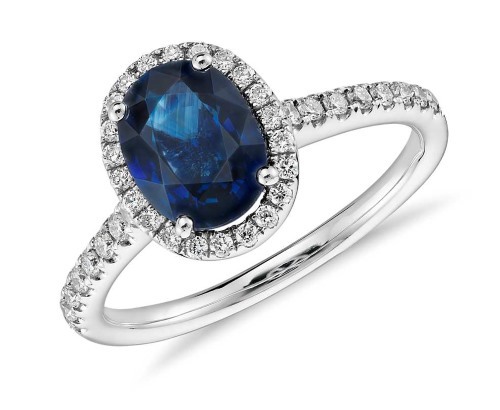 Read more about how to pick a sapphire ring. Sapphire and Micropavé diamond halo ring in 14k white gold. Love the deap blue color and all the smaller diamonds set around the centre sapphire. Only a Ruby can rival the romance of red roses. This gorgeous precious gemstone has been mined in exotic locations and gifted to royalty for their most coveted collections. The July birthstone is the fraternal twin of Sapphire, making them the only two members of the Corundum family. The hardness of Ruby is legendarily behind only Diamond and Moissanite at a 9 on the Moh’s scale. This is a fantastic alternative to a diamond for everyday wear in an engagement ring, yet the price of a Ruby is often similar to a diamond. Especially when shopping for larger Rubies, you might be shocked at the price. For some reason the gold/red combo appeals to me much more than a ruby paired with white gold or platinum. 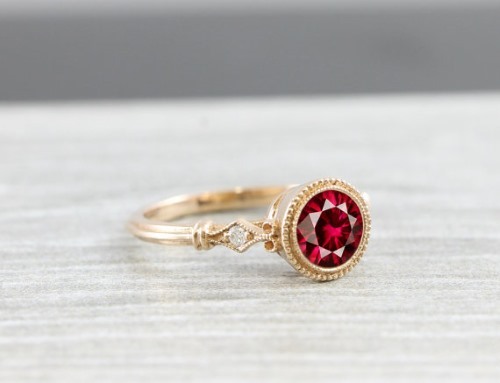 This art deco ruby ring from Etsy seller Aardvark Jewellery is quite nice. The central round cut ruby is lab grown, but that shouldn’t scare you away. Lab grown rubies are identical to natural rubies, and are much more affordable. Topaz has appeal to a range of people because of its diversity of colors. The most beautiful Swiss Blue or Imperial Red can be found in the semi-precious gemstone, Topaz. The hardness of 8 on the Moh’s scales helps us give our endorsement for this stone as a diamond engagement ring alternative. You may see small scratches after years of wear, but this will take some real work to achieve. If you want a lot of carat for a fraction of the price of diamonds, a stone like this London Blue Topaz may be just what you want. Blue may not be to everyone’s taste for an engagement ring, but the shear size, sparkle, and split shank design of this ring certainly makes a bold statement! The lovely green/blue of Aquamarine describes only the loveliest of exotic seas. Aquamarine is a member of the Emerald family called Beryl. Known as the birthstone for March babes, this gemstone has caught some attention for its ability to be worn by anyone. A 7.5-8 on the Moh’s scale, we love this stone for engagement rings. The range of colors from light to dark and green to blue give variety for the stone that you will wear forever. 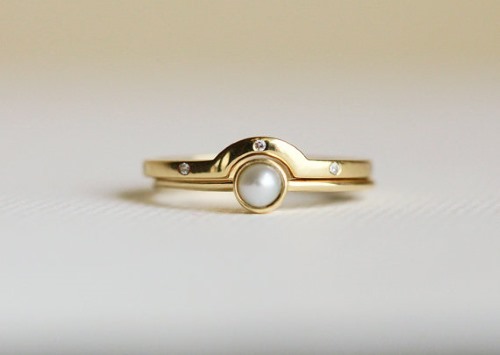 Classic halo setting from an Etsy designer based out of Alabama. 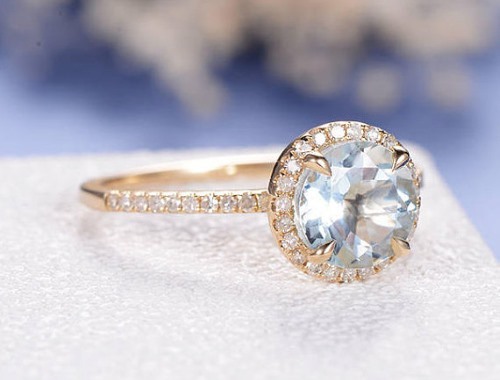 You’ll appreciate this aquamarine gemstone ring the moment you put it on your finger. The gorgeous green of this precious gemstone had a lifetime love with Elizabeth Taylor and continues to stun on the red carpet at every awards show. A family member of Aquamarine and the birthstone for May, this is the most vivid of the family called Beryl. Although Emerald has a hardenss of 7.5 – 8 on the Moh’s scale, it is characteristic for it to have many fractures that make the stone more fragile. 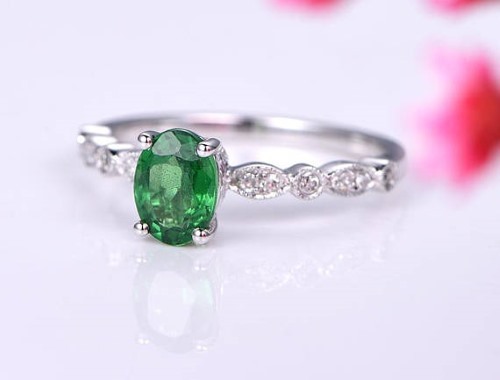 We don’t recommend Emerald for engagement rings that are worn everyday, but we can absolutely recommend it as a side stone for those who are in love with the vivid green beauty. This ring really got us thinking: must you buy a brand spanking new engagement ring? 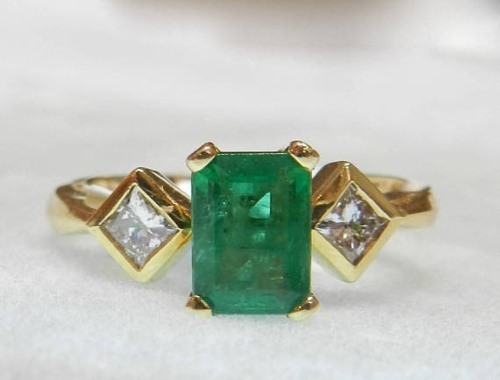 The emerald ring pictured is from the 1980s, done in a wonderful art deco style. We picked this ring as our emerald (Etsy) find to prove that you don’t need to buy brand new — there are so many amazingly designed vintage rings out there for great value! Consider an ‘already loved’ ring as an alternative also. Literally resembling the blush of a bride, this pale pink beauty will make you fall in love all over again. The sister of Emerald and Aquamarine, this Beryl family stone is the shy member that you’ll want to know. 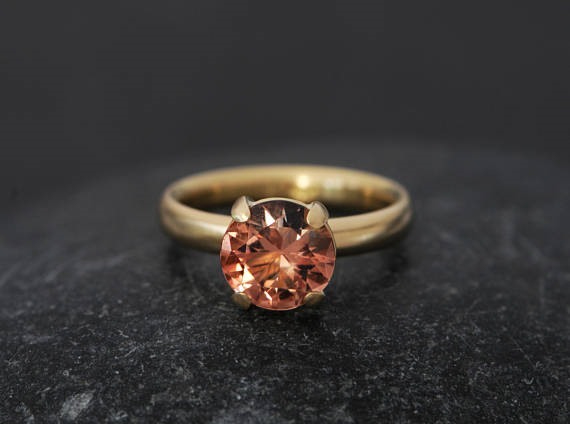 From pink to orange, the color variations for Morganite are the perfect range for cool or warm skin tones. A higher hardness of 7.5 – 8 on the Moh’s scale, let’s us give our full endorsement for this stone as a diamond engagement ring alternative. So go ahead, look, fall in love, and wear this stone until death do you part, you have our blessing. ‘Passerbys will gawk upon catching a glimpse’ — according to one reviewer of this pretty pear cut morganite ring with diamond halo. The spectrum of colors in the family of Tourmaline gives you unlimited options. From a single color to stones with 3-colors, Tourmaline will be your new best friend. Hardness of 7 – 7.5 leaves this stone right on the border of yes and no for our recommendation as a substitute for a diamond in a ring. We’re so crazy in love with the colors that we have to say go ahead and take the risk! Worst-case scenario, you’ll have to replace the stone in the future. It was difficult to pick just one color to represent our tourmaline pick as there are just so many colors to pick from! We settled on this lovely oval cut salmon pink Tourmaline solitaire engagement ring in white gold. This semi-precious gemstone is the royal member of the quartz family. A gorgeous purple (and much less costly) alternative to diamond will catch every eye with intense color. Also, Amethyst is known for being the birthstone of lucky February babies, but can be worn by absolutely anyone. With a hardness of 7 on the Moh’s scale, we can’t recommend this for everyday wear. Although, if you love the stone and can’t live without it on your engagement ring, you can make it work. Either replace the stone every couple years and choose from the range of colors, or choose a bezel setting for your Amethyst that encircles the gemstone in metal to help prevent damage. 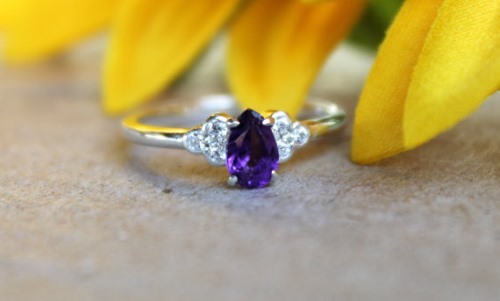 We love this dainty amethyst ring from BlueSunflowers — a 5 star Etsy seller from Vancouver, Canada. The pear shaped stone is unique, and the overall low profile of the purple stone with 14k white gold creates a lovely look. The softest and most gentle appearing stone of the quartz family is named Rose. The gentle color of this stone often appears a bit milky and gives a feeling of calm. The high abundance of this stone makes them readily available and low in price too. The hardness of 7 on the Moh’s scale makes Rose Quartz a tough stone to recommend for an engagement ring. The sharp corners of each facet will expose it to wear; yet, you can find this stone cut with a smooth top, which will help prevent the inevitable chips. 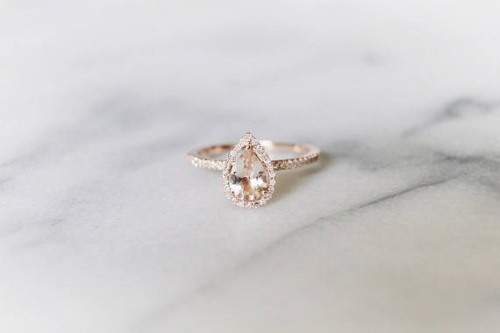 Might we recommend Morganite, which looks just like Rose Quartz but wears a little longer? The decision is yours. 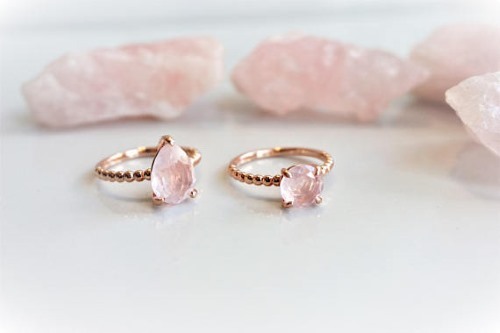 We’re struck by the light airiness and simplicity of these rose quartz ring designs. The soft pink hue of the stone really captured our eye. The deep red of this stone brings wine and cranberries to mind. This January birthstone brings sentiments of mystery and romance to onlookers. With a hardness of 6.5-7.5, this isn’t the perfect stone for everyday wear but isn’t impossible. Get ready to replace this semi-precious gemstone in a decade or wear it in a low setting if you choose this as an engagement ring. 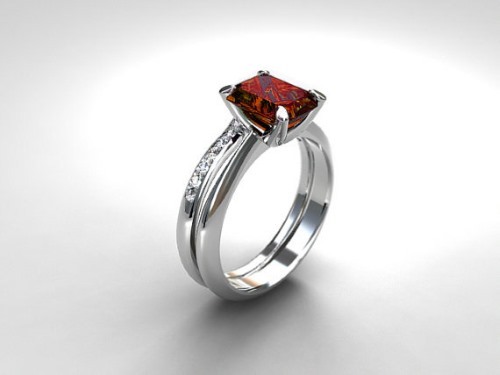 This ring gives you a good idea of the type of look you’ll get with a deap red garnet stone. Made in Finland by a top rated Etsy seller. The bright green color of a Tsavorite is mesmerizing. The color of this Garnet family stone often tricks onlookers into thinking it is an Emerald. Tsavorite has hardness anywhere between 6.5-7.5. We recommend this stone in lieu of Emerald because of its overall durability, but can’t recommend that it be worn everyday. We admit, tsavorite wasn’t in our vocabulary before doing this post, and we bet you didn’t know about it either! There is something about this sparkling emerald-esque green stone that really draws us in. Love this oval cut tsavorite engagement ring design. This dark and mysterious stone that can be polished to a mirror like shine peaks our interest for Onyx. With a jet-black appearance, an Onyx rivals the mystique of a black diamond. Normally worn as a bead or with a domed top, Onyx will appeal to someone who wants a larger stone without the larger price tag. A hardness of 6.5-7 on the Moh’s scale means this stone will begin to show its wear after everyday enjoyment, but not immediately. The smooth cut top of most of these stones help to prevent chips and wear, but they aren’t indestructible. We’re on the fence about this as a diamond alternative. The black beauty of gemstones, Onyx rings like the one pictured are a site to behold in person. 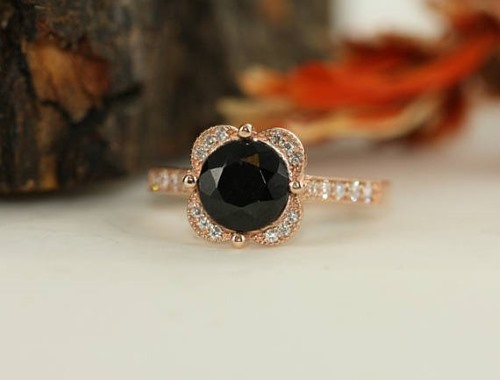 Deap black color similar to a black diamond gives Onyx infused rings a personality and style all their own. The deep green of a Peridot has enticed more than just those born in August who claim it as their birthstone. 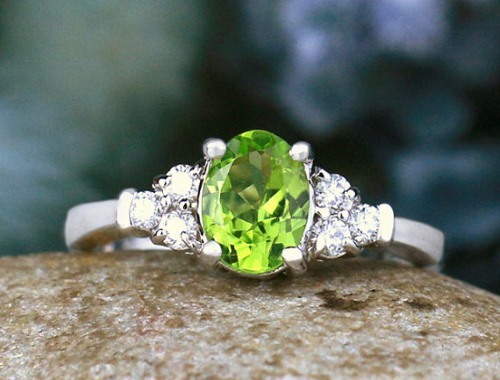 Some of the most beautiful Peridots can range in color from olive to lime green. This semi-precious gemstone is a 6.5-7 on the Moh’s scale, so we can’t put our full endorsement behind this stone for an engagement ring. The scratches and wear will show through after a few years of everyday wear. A lime green color that’s refreshing and unique. Peridot rings like the one above paired with a 14k white gold band look quite interesting! This stunning purple/blue stone is fairly new to the market. Found only in the country of Tanzania, the 1980’s brought this stone into the mainstream after it was discovered in the 1960’s that the naturally brown stone could be heat treated to turn it into its now signature color. Though the color of this stone is enticing, the 6-7 Moh’s scale hardness and low durability make this gemstone less than desirable for an engagement ring. Quick scratches and chipped edges will change the appearance of a Tanzanite with daily wear. 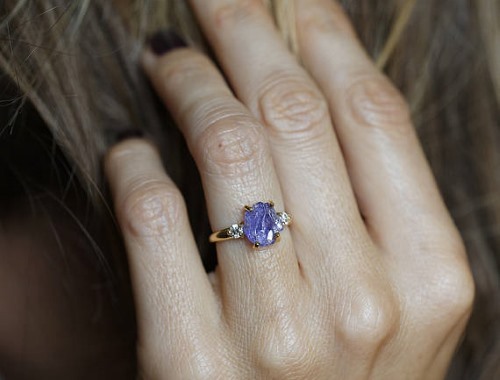 This raw tanzanite gemstone ring is something a bit different. We wanted to show the natural beauty of this blue stone, not to mention it will always be a one of a kind piece! Only a couple stones can bring the beauty of the Northern Lights into a stone, and Labradorite is one of them. The blue sheen that glides from side to side depending on the angle is the most enchanting aspect of this stone. A diamond alternative for the bride with a sentimental side, this gemstone is also widely available at fraction of a diamond’s cost. The smooth cut of the majority of these stones helps prevent chips, but the hardness is a 6-6.5 on the Moh’s scale. So, we have to find this stone a better idea in an engagement ring that isn’t worn everyday. Sigh. An ethereal and mystical looking stone that draws you in with its myriad of kaleidoscope colors. Made in America by top Etsy seller WanLoveDesigns. The glistening specks within a sunstone can only remind us of its namesake. The perfect combination of deep orange and gold makes this stone gorgeous in any cut. While we love the look of this stone, the 6 – 7 Moh’s scale hardness of this stone makes it better to wear only occasionally. If you love this gemstone, consider a necklace to wear each day. You likely won’t find that many options for Sunstone engagement rings, we didn’t etither. 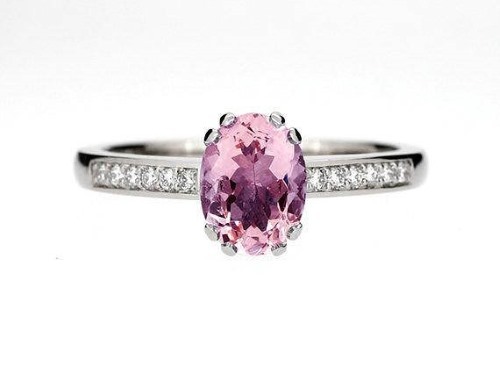 This relatively unknown gemstone has a warm feminine color we just love. Would love to see how this ring looks in a white gold band though. The varieties of this stone are amazing! White, blue, and orange are three of the available colors for this stunning stone. Grown slowly in the water rich ground, this stone reflects flashes of light that rival the Northern lights with the movement of a jellyfish. 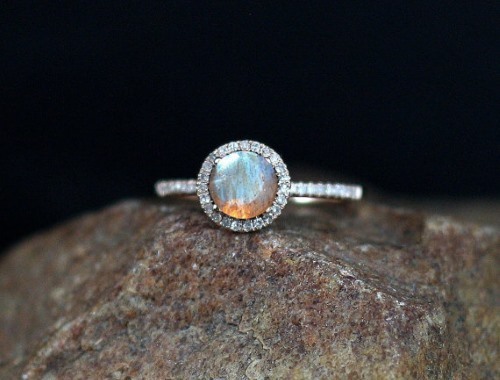 Although we love Opals, they are a very fragile stone at a hardness of 5-6.5 that makes it impossible for us to recommend Opal for an engagement ring that’s worn everyday. Think an opal is unlucky to wear if it’s not your birthstone? Superstition from a fiction book written (by Sir Walter Scott) in the 1800s! In fact, throughout most of history, opal has been regarded as the luckiest and most magical of all gems. The myriad of colors an opal ring like this one above shows is truely astonishing. LOVE the lotus diamond design on the side to offer some protection for the stone! 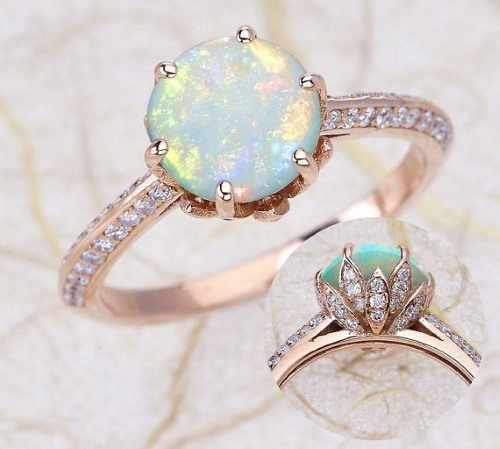 More Opal Engagement Ring Picks! This gorgeous stone has a long history of being the most adored stone of the gods a millennium back in time. The lore of this stone alone gives it a romantic feeling. Though the hardness of Turquoise is 5-6 on the Moh’s scale of hardness, this stone is often cut to have a rough appearance. Everyday wear and tear will scratch the surface of the stone, although it is meant to have a worn and natural appearance. This makes Turquoise the lowest hardness stone on our list that we would recommend for an engagement ring. Enjoy the natural appearance and feel free to let this stone represent your love. 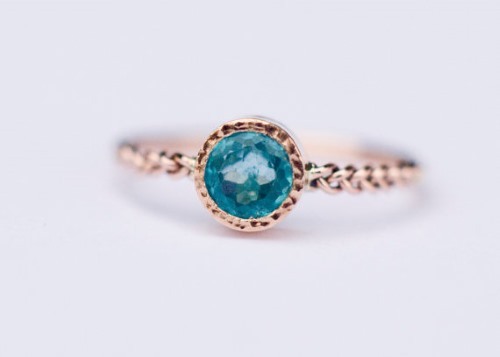 There’s no mistaking the unique beauty of a turquoise gemstone ring. It seems like this stone offers up designers the chance to really create many fabulous designs that pop with personality from that quintessential turquoise color. 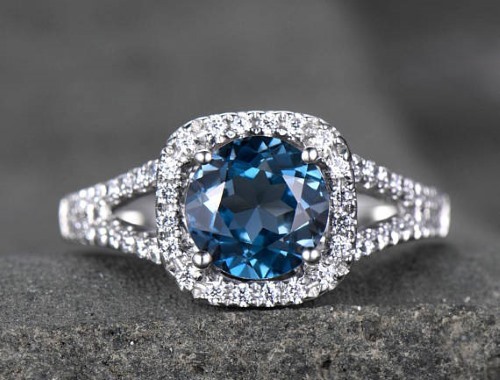 It’s impossible to avoid the bright blue of this stone; it will definitely stand out on the finger of a bride. With veins of pyrite (fool’s gold) naturally running through this stone, it gives the feeling of royalty and importance to its wearer. This is not one of the hardest stones, a 5-5.5 on the Moh’s scale, we’d recommend that brides avoid this for an engagement ring. Yet, for the natural gal who wants something more with a weather worn look, this may be perfect. Given the softness of this stone, there aren’t a whole host of options when it comes to woman’s rings. 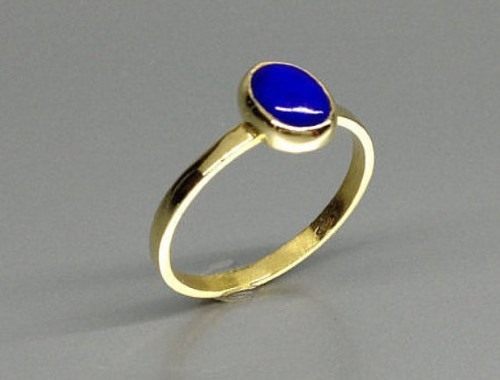 I love the stone, and found a number of really great mens wedding bands with lapus lazuli inlay. This ring shows the potential though. No, you won’t get hungry (appetite anyone?) by choosing this stunning semi-precious gemstone! From a transparent faceted stone to a translucent bead, Apatite gives you choices. The gorgeous blues and greens may be appealing, but the hardness of 5 on the Moh’s scale make this stone nearly impossible to wear each day without visible damage. This one is better left for an occasionally worn fashion ring. 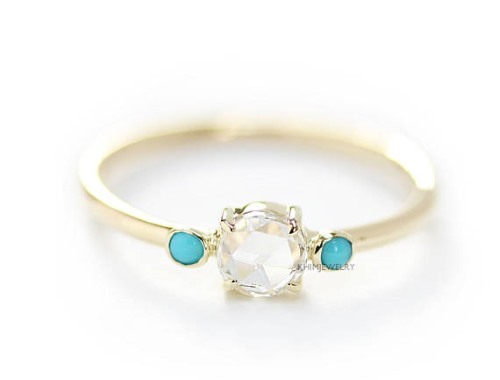 A beautiful example of an apatite ring in 14k gold, with unusual blue gemstone color. Love the delicate gold knot design of the band and the striking blue/green color of the stone. This ring could be worn for special occassions or date nights as an elegant jewelry piece. These gorgeous beauties have been found in the most beautiful underwater worlds and brought to live on earth. From white to black and round to square, Pearls have diversity that holds a lustrous appeal and acts as the birthstone for June babies. With a hardness of just 2.5-3 on the Moh’s scale, we are sure that this stone will not last a lifetime in an engagement ring. Although, a strand of pearls will last longer and fulfill the something old and new on your wedding day. Lovely example of a pearl and matching diamond ring set. As a side note, the designer MinimalVS is from the capital city of Ljublyana in Slovenia. We visited Slovenia for two weeks last year and would highly recommend it as a top travel destination if you get the chance. Who knew they also have such talented jewelers!? Our final piece of advice is simple: get the stone that makes you happiest for your engagement ring. Remember that if you like a precious or semi-precious gemstone that isn’t recommended for everyday wear, you do have options. Choose a setting that will help lower the likelihood of damage (take a look at a bezel setting and see what you think). Have the stone re-cut after years of wear and tear. Replace the stone with another when it looks like the wear has gotten the better of the stone or caused a chip. You found the perfect partner who isn’t always traditional, and you don’t have to be either when it comes to the rock on your finger!